A variety of banner stands that are versatile and easy to setup. 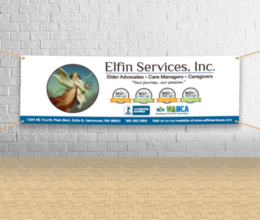 Durable indoor or outdoor vinyl banners for your special event or company. Unique and premium business cards designed to make your cards stand out from the crowd. Let current or potential clients know you stopped by with high quality door hangers. Get professional grade full color flyers to get you noticed. Custom mouse pads can be the best gifts for your customers to get business and contact information. Name badges not only make each person wearing them more approachable, but they become a walking billboard. Custom printed notepads are great leave-behinds for your customers to have business and contact information on hand. Custom envelopes are great for branding and getting your name out there right off the bat. A great tool for keeping your customers up-to-date on how your business is growing. Have a professional look when presenting to your customers. Professional-grade, full color posters at a cost you can afford and a quality you’ll love! Add a finished professional look to any table display, trade show booth, or special event.